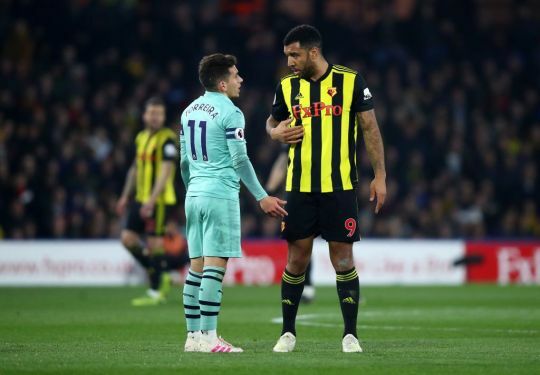 Former Manchester United defender, Gary Neville, has said that Troy Deeney overstepped the mark, after the Watford captain was dismissed against Arsenal for flinging his arm into Lucas Torreira’s face after just 11 minutes. Deeney was sent off less than a minute after Pierre-Emerick Aubameyang had given Arsenal the lead, by referee Craig Pawson after appearing to catch Torreira with his forearm. The Watford captain was furious with the decision and made his feelings known to the fourth official as he made his way down the tunnel. However, Neville sided with the referee’s decision and stated it was “stupid’ from the 30-year-old. “He’s trying to lead but it’s just a stupid thing to do. “The linesman’s got a great view of it, he’s thrown his forearm into the face of Torreira. “I think 15 years ago you’d probably say he’s not done a lot wrong, in the 2019 Premier League he’s got nowhere to go,” Neville said on Monday Night Football.